Helen DeVos, one of the Grand Rapids Symphony’s dearest friends, has died, but her love and support for the orchestra will last forever. It’s safe to say that without Helen DeVos, the Grand Rapids Symphony would not exist as we know it today. For nearly 50 years, Helen DeVos was the Grand Rapids Symphony’s biggest supporter, and its greatest champion. For decades, Helen and her husband, Rich DeVos, have been devoted patrons of the arts in Grand Rapids and West Michigan. Providing support that would lead to the opening of DeVos Performance Hall, the Grand Rapids Symphony’s principal home, was just one of many causes the DeVoses supported. But the Grand Rapids Symphony has been especially near and dear to her heart. Less than two weeks before her death on Oct. 18, 2017, Helen and Rich DeVos were in the audience for the Grand Rapids Symphony’s Classical Series concerts in DeVos Hall. “After attending many concerts over the years, we know that the orchestra provides inspiration, education and enjoyment for the people of West Michigan,” Helen DeVos said last year. When Helen DeVos joined the Grand Rapids Symphony’s Board of Directors in 1971, it was a community orchestra with an annual budget of $100,000 that presented 10 concerts a year. Today, the Grand Rapids Symphony is a world-class professional orchestra with a roster of 80 full-time and part-time musicians, performing concerts in eight different subscription series plus special events, all with an annual operating budget of just over $10 million dollars. Music Director Marcelo Lehninger said the depth of support for the Grand Rapids Symphony from people such as Helen DeVos played an important role in his decision to accept the position with the Symphony. Helen DeVos, however, did more than donate money. For nearly 20 years, she was an active member of the Grand Rapids Symphony’s Board of Directors, serving as board secretary from 1974 to 1982 and providing quiet leadership and wise counsel to the organization’s leadership. Following her retirement, she was named an Honorary Board Member in 1991, and she became one of the first recipients of the symphony’s BRAVO! Award, the Grand Rapids Symphony’s highest honor. 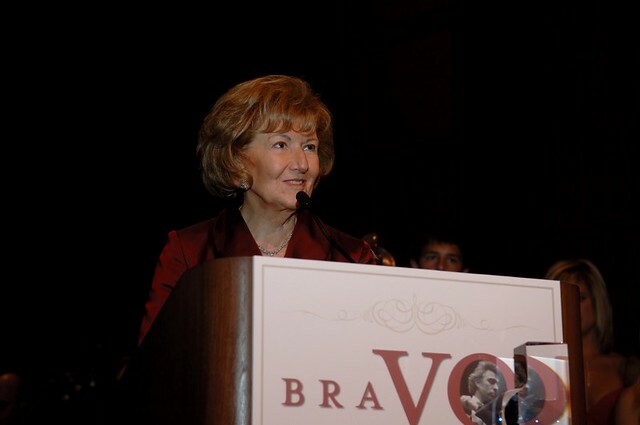 In 2007, the Grand Rapids Symphony presented Helen DeVos with its first BRAVO! Lifetime Achievement Award at a gala dinner and benefit concert in DeVos Performance Hall that also raised more than $25,000 for the orchestra’s educational programs. “I’m not sure I merit all that,” Helen DeVos said at the time. Her friends and colleagues thought otherwise. “What I think is very interesting is, if Mrs. DeVos were here, she’d be very humbled by this,” Associate Conductor John Varineau said to WZZM-TV 13 during a public visitation that drew throngs of well-wishers to the Amway Grand Plaza Hotel on Monday, Oct. 23. In 1974, the Richard and Helen DeVos Foundation provided the initial funds to hire five full-time musicians – two violinists, a violist, a cellist and a double bassist, beginning the process of transforming the Grand Rapids Symphony from a community orchestra to a professional orchestra. Four of the five were organized as the DeVos String Quartet. Today, the four principal players of the Grand Rapids Symphony’s first and second violins, viola and cello sections continue to perform as the DeVos String Quartet. Soon, a woodwind quintet, a brass quintet and a timpanist and a pianist would follow. Significantly, the DeVos Foundation also funded the first full-time development director to raise money for the orchestra. Another woman, True McDonald, recruited Helen DeVos to serve on the Grand Rapids Symphony Board of Directors. Helen DeVos guaranteed that her vision for the future growth and success of the Grand Rapids Symphony would live on into the future. In 2012, the orchestra launched its $40 million Legacy of Excellence Campaign to build a permanent endowment to secure the orchestra’s future. Helen and Richard DeVos led the campaign with a $20 million leadership gift. Within four years, the Grand Rapids Symphony met its goal, securing an additional $20 million in cash, gifts, ongoing pledges and estate plans from more than 150 individuals, couples, corporations and foundations. Once fully funded, revenue from investments from the Legacy of Excellence Campaign is expected to contribute about $2 million per year to the orchestra’s operations. The former Helen Van Wesep came by her love of the Grand Rapids Symphony honestly. At age 4 she began piano lessons. As a child growing up in Grand Rapids, her parents took her to concerts with such legendary performers as violinist Fritz Kreisler and tenor Jussi Bjoerling. But it was a music appreciation class that she took at Calvin College that changed everything. “That’s probably the genesis of my enjoyment of symphonic music,” she said in 2007. At the 2007 BRAVO! Awards, Helen DeVos made it clear that, through her support of the Grand Rapids Symphony, she hoped to give the gift of music to future generations in West Michigan.